Notice the little pebble in the foreground? And the big white spot on the lid? And ugh... ignore the hard water deposits. Totally my fault. The lid wasn't seated properly - just sort of balanced on the top, letting steam vent from the teapot, and I moved too quickly. The lid fell off, and bounced pinball-style off the edge of the ceramic sink (that's when the little tab parted ways with the lid), then off the open dishwasher door, before skittering across the kitchen floor. I checked my Amazon orders - I've been using that teapot to heat my water for coffee for three years. Damn it. I immediately threw a temper-tantrum (in a 47-year-old that takes the form of some wailing, shouting and a whole-lotta f-bombs). You see, this is the THIRD teapot lid I've broken. The first one (and it was a birthday present, too!) fell off when I was pouring. The second one (another gift!) wasn't technically coffee equipment - rather it was for displaying pretty tea as it steeped - but the lid fell out of a cabinet when I was groping up there blindly because I was too lazy to get the stool). 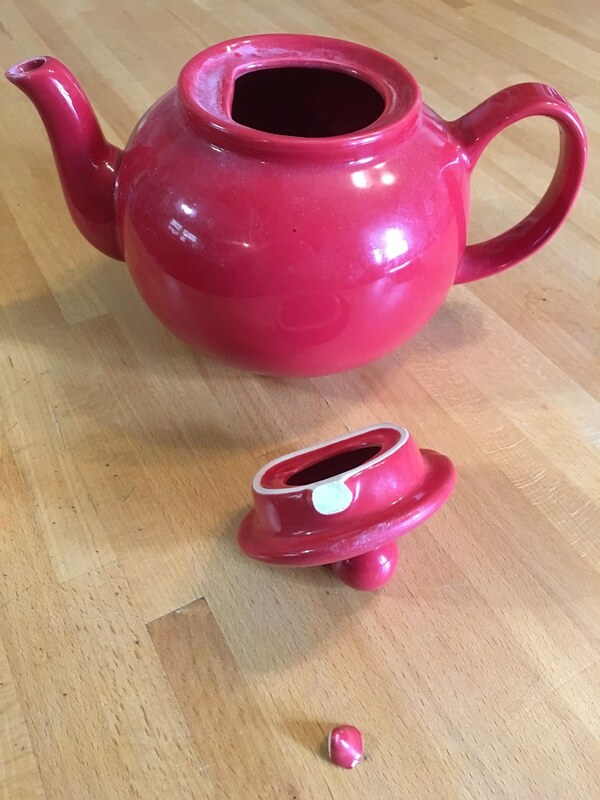 Before buying the red teapot, I actually researched them and decided to get ceramic because a) it should hold the water temperature longer while I brewed coffee (not in the teapot, though - that's just for heating and pouring the water) and b) more durable. And it was - I dropped the lid several times, and it never broke until now. I also chose that teapot because it had a captive lid - the opening is D-shaped with a little tab on the lid so it wouldn't fall off when pouring. 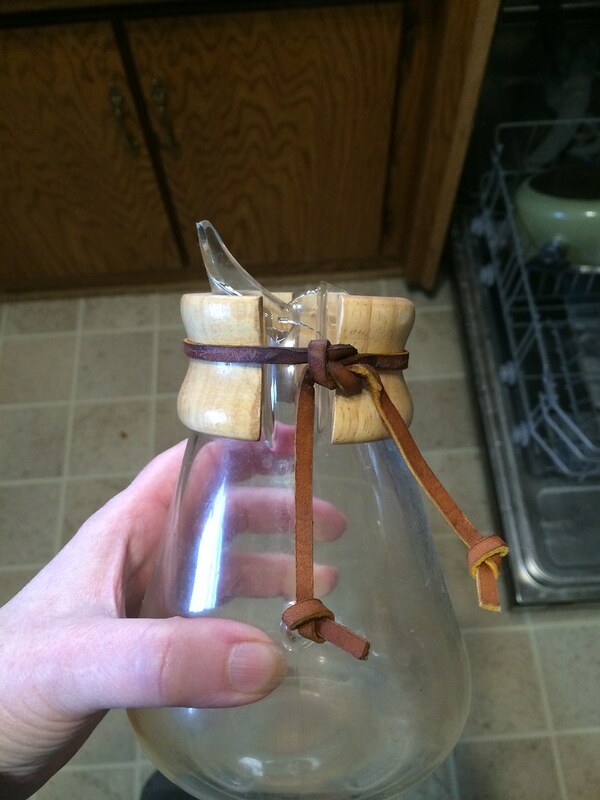 The captive lid is a huge plus, as that's how I'd broken my first one. Captive lids CAN fall off (like when they aren't seated properly and you're rushing around), but you practically have to turn them upside down before they will. Not only teapots - but coffee pots aren't safe. My first Chemex pot - the smallest 17-ounce one (and another gift!) - fell off the knickknack shelf that runs along the top of my kitchen. At least that one wasn't caused by me being klutzy - it just fell off for no apparent reason. That one was particularly sad as that's the coffee pot I was using when I brewed my first GOOD cup of coffee. 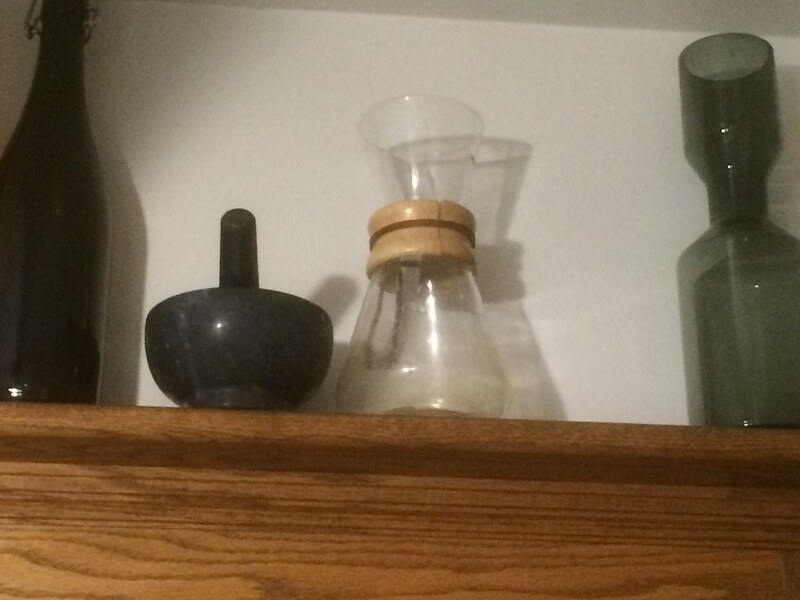 It wasn't in use, which is why it was residing on the knickknack shelf, and I had graduated to bigger capacity Chemex - my teen likes her coffee too, and rather than share, I just made more coffee. 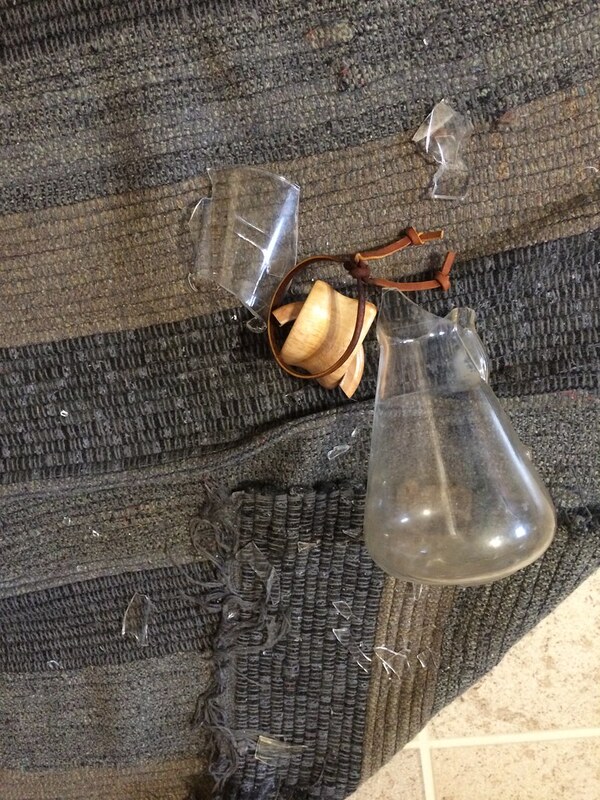 But, even borosilicate glass breaks when it falls from 7 feet up. I could have glued the tab back on, but that would put glue in contact with my hot water (via steam and condensation), and that's unacceptable. The teapot still works fine, but I have to remember to hold the (hot as hell) lid on as I'm pouring, and since the tab broke off, I've already dropped the lid while pouring once. So. When I bought my Duo Coffee Steeper almost a year ago, I ordered an extra glass carafe in case I break the first one (haven't yet). I've ordered a new teapot, but that'll be a different post, I think. But, I will tell you this: I got one with an extra lid. The aftermath of the dive from the knickknack shelf. There it is... before it dived off.